Is breaking into the biz of creating new search engines and Web browsers feasible when you have O.G.s like Google and Firefox still running the show? Maybe. But it really depends on the definition of success. If history has anything to say, it’s that dominating the mainstream isn’t easy, and concepts looking to do that might not succeed. Over the past few months, there’s been buzz around a few new services: two search engines, of sorts, and a Web browser. These include Spindex by Microsoft FUSE Labs, a search engine for social media; blekko, a search engine that uses the concept of “slashtag search” to refine results; and RockMelt, a social-centric Web browser. Intelligent, creative, bright-eyed people with a vision have poured their heart and souls into these concepts, leaving us to wonder what it all means in the big scheme of things. The good news (for them) is that none of them seem to be looking to be the next Google or Firefox. 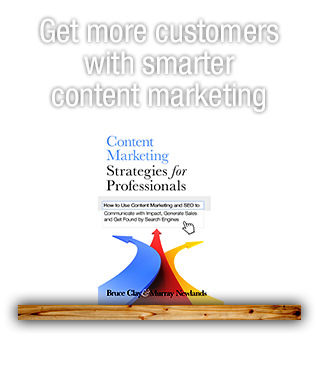 They are looking to fill in the gaps or capitalize on the progression of search in some way. You may have remembered my review of Spindex in July. Spindex is a self-proclaimed “personal search engine for social media” that basically aggregates all the information from your personal social networks and analyzes it to make your search experience more meaningful. My final thoughts on Spindex when I reviewed it was that it was another step in making our social media usage easier, and allowing it to have more meaning, more purpose. Businesses can use Spindex to monitor the conversations that matter and learn more about the audiences they serve. All in all, I think it’s a pretty nifty tool that can assist in brand management and engagement. UPDATE: 11/19: Jim Lewallen of Microsoft FUSE Labs (the creators of Spindex) stopped by the blog after this post went live to talk a little more about the service and its goal. In his comments below, Jim says that Spindex is meant to enhance your social content by using search results (versus being classified as “social search”). I asked him how Spindex was pulling in bing results and if they were the same in Spindex as they would be in a SERP. Jim says that for any given keyword Spindex pulls from tweets, Facebook or an RSS feed, Spindex shows the same results as bing would, but news articles are often favored over other results because they are more timely. One benefit of viewing results in Spindex, Jim says, is an uninterrupted search experience. Meaning, you don’t have to stop what you’re doing in Spindex to get more information on something in your social stream. Jim told us today that the new version of Spindex is live for everyone, so get on in there and play around! I haven’t spent a lot of time in it yet but am looking forward to it — I already like what they’ve done to the look and feel. blekko is a search engine that offers the concept of “slashtag search.” By using the “/” plus a command in your query (e.g., /humor), the intention is that you further refine your search to cut out all the chatter you’re not looking for. blekko claims to slash the spam from your results. 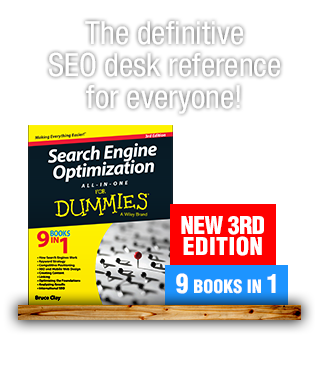 It also offers up a lot of data on websites, which helps make SEO and competitive research easier. Check out blekko in beta if you haven’t already. More features are available to you if you receive an invite to play. RockMelt has a video that helps sum up the browser if you haven’t had a chance to dive in yet (notice the Google-esque acoustic guitar in the background). Or go to RockMelt.com to request early access. 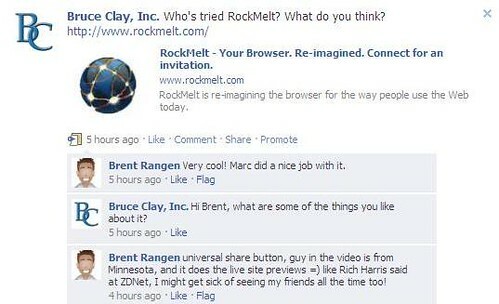 So what is RockMelt’s fate as far as mainstream popularity goes? Your guess is as good as mine. But recent reports show that good ol’ boys like Internet Explorer aren’t necessarily holding their power positions. In “The Chrome Assualt: IE’s Walls Are Crumbling,” it highlights that even though Google Chrome owns less than 10 percent of Web browser market share, it’s growing rapidly, while Internet Explorer is not. This might just be the time for a company like RockMelt to get in on the game. What are your thoughts on these new kids on the block? Hi Brent! Thanks for stopping by and talking a little more about RockMelt. I’m embarrassed to say I haven’t even tried it yet. Must do that. Forgot to say how much I have been enjoying RockMelt. The built-in features are leaps and bounds better than Firefox add-ons and even chrome extensions. Even with FB user data and RSS updates it is still extremely fast. This is now my primary browser. If Facebook works with Rockmelt a bit, I could see how between the two they could come up basically an IRC-type chat feature built right in. Spindex looks really cool. Not bulky or clunky at all which is the main reasons I usually find myself not using social media tools like tweetdeck or hootsuite. It could be really effective method for SMO, especially when that universal share button in RockMelt. Good morning, Jim! I like the way it’s looking. I’ll get in there and play around some more and also mention to folks in our Friday Recap today. Thanks for keeping us posted — very cool of you. Jim, thanks for explaining — appreciate it. Keep us posted on new developments, and take good care! We’re using the same API’s everyone else does to do Bing queries, although often we prioritize Bing news articles over web results as they’re more “time based”, following the timely nature of a social stream. For any given set of keywords in a Tweet, Facebook post or RSS article, we will return the same results that you would get by doing the search directly on the Bing page. We provide it in situ however rather than having you stop reading your social stream to look up more information. In the end, that’s what we think Spindex is about; the trending topics, the synopsis overview and the contextual search results all are designed to bring information to you without you having to ask for it. Hi, Jim! Thank you for stopping by to talk about Spindex! One thing I was wondering is how Spindex was pulling in the bing results — are they exactly the same in Spindex as they would be on a SERP in bing? Looking forward to playing around with the new version. Spindex-wise, we’re focusing on ehancing your social content using search results rather than social search persay. The goal we’re working toward is to provide you context for your stream that informs or entertains. So if you have a stream item describing SEO and a company name, we’ll likely grab those as keywords and the context panel will show content from bing based on the keyword search. We have a new release of Spindex coming out shortly that addresses a number of issues, improves trend calculation, and has been rewritten entirely in HTML so we don’t require plug-in installation. We’ll start making noise about it as soon as the new release is ready (very soon now). I do like Blekko (had no experience of the others), but I don’t think it’ll see any mass appeal. 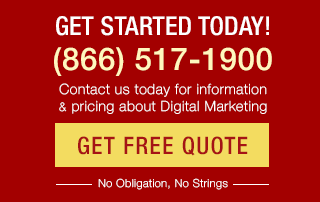 Sure, it offers lots of great SEO information, but the key difference it has is “slashtags”. I’ll bet my last quid that if I walk out of the office, stop someone at random and say “hey, what’s a slashtag?”, I’ll be met with blank incomprehension. People don’t want social search. They want fast, accurate search.